7. How many Flip-Flops are required to build a binary counter circuit to count from 0 to 1023? Which of the following is the correct method to refer to the year member? 12. Which of the following is not a linear data structure? (A) can be used with PAM only. (B) combines five groups into a supergroup. (C) stacks 24 channels in adjacent frequency slots. (D) interleaves pulses belonging to different transmissions. 20. 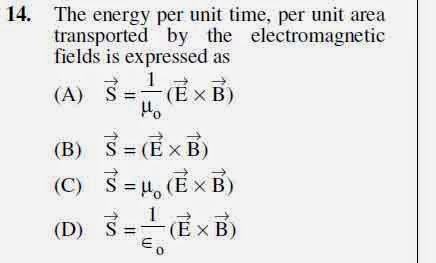 Which control system has hysteresis property? Directions : Q. Nos. 21 to 30 : The following items consist of two statements, one labelled the “Assertion (A)” and the other labelled the “Reason (R)”. You are to examine these two statements carefully and decide if the Assertion (A) and the Reason (R) are individually true and if so, whether the Reason is a correct explanation of the Assertion. Select your answers to these items using the codes given below and mark your answer accordingly. 21. Assertion (A) : If a semiconductor is placed in a transverse magnetic field B and an electric field E is applied across its other two faces, then it would produce an electric current I, in the direction perpendicular to both B and E.
Reason (R) : Hall co-efficient is proportional to the mobility of charge carrier in semi-conductor. 22. Assertion (A) : The voltage-current characteristic of tunnel diode exhibits dynamic negative resistance region. Reason (R) : The negative resistance occurs, therefore, tunnel diode behaves as low power oscillating device. 23. Assertion (A) : R-2R ladder type D/A converter has a higher speed of conversion than a weighted resistance D/A converter. Reason (R) : R-2R ladder type D/A converter uses a smaller number of components than the weighted resistance D/A converter. 24. Assertion (A) : A processor can reference a memory stack without specifying an address. Reason (R) : The address is always available and automatically updated in the stack pointer. 25. Assertion (A) : The part of root locus on the real axis is not dependent upon the poles and zeros which are not on the real axis. Reason (R) : Poles and zeros which are not on the real axis always occur in conjugate pairs. 26. Assertion (A) : The top down structured programming should be used for developing programmes. Reason (R) : The top down structured programming methodology enables us to get readable and easily provable program. 27. Assertion (A) : Stimulated emission is the key to the operation of LASER. Reason (R) : An important property of laser radiation is its coherence, under which is meant the correlation between the phases of oscillation at different positions in space and at various moments of time. 28. Assertion (A) : An half adder is faster than full-adder. 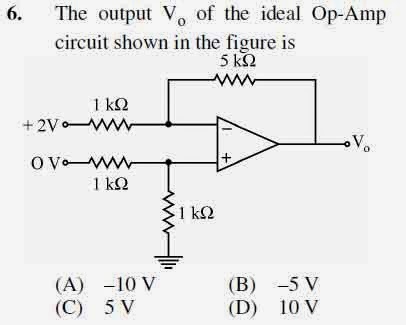 Reason (R) : An half adder gives only one output while a full adder gives two outputs. 29. Assertion (A) : A programmable Read-Only-Memory can be used as a synchronous counter. Reason (R) : Each memory location of a programmable Read-Only-Memory is programmed and can be read synchronously. 30. Assertion (A) : In PCM a message signal is represented by a sequence of coded pulses, which is accomplished by representing the signal in discrete form in both time and amplitude. Reason (R) : The signal encoded in the form of quantized samples which translates into a coded number. Noise may be defined, in an electrical sense, as an unwanted form of energy tending to interfere with the proper and easy reception and reproduction of wanted signals. Many disturbances of the electrical nature produce noise in receiver, modifying the signal in an unwanted manner. Noise is divided into two groups. Noise whose sources are external to the receiver and other one is noise created within the receiver itself. Various forms of noise created outside the receiver i.e. external noise includes atmospheric and extra-terrestrial noise and industrial noise. Atmospheric noise becomes less severe at frequencies above 30 MHz. Extra-terrestrial noises are solar noise and cosmic noise. They radiate over a very broad frequency spectrum which includes the frequencies, we use for communication. These disturbances are at the eruption of corona flares and sunspots. The noise generated is due to the random motion of electrons, atoms and molecules. Kinetic theory states that the temperature of the system increases due to the motion of the particles. 47. Indicate the false statement. (A) HF mixers are generally noiser than HF amplifiers. (B) Impulse noise voltage is independent of bandwidth. (C) Thermal noise is independent of the frequency at which it is measured. (D) Industrial noise is usually of the impulse type. 50. Indicate the noise whose source is in a category different from that of the other three.